You may have noticed when creating Business Process Flows (BPF) in PowerApps from your own Entities that they don’t always show up in the dropdown box in the ‘create new’ wizard. This is because by default you are not able to create BPF’s from a custom Entity, you must first enable it yourself. This used to be done in a tab called Advanced which used to be featured on the Welcome screen of PowerApps on the left-hand side, however, this has since been replaced with a newer feature called ‘Solutions’. Because of this the settings we need to access are a little harder to find but are not too far away. In this example I will use an Entity called ‘BusinessTravel’ but these steps will work with any other one of your custom Entities. 1. On the welcome screen of PowerApps, Click on ‘Solutions’ on the left-hand side of the screen. 2. Then click on ‘Common Data Services Default Solutions’, this is where all your Entities will be stored. 3. You now need to click on the ellipse button on the top of this page which will show a dropdown box containing ‘Switch to classic’, click on this, it will take you to the old ‘Advanced’ page. 4. In here, on the left-hand side of the screen, click ‘Entities’ and then click on your Entity. This will bring up an Entity Information screen which includes the setting we need. 5. 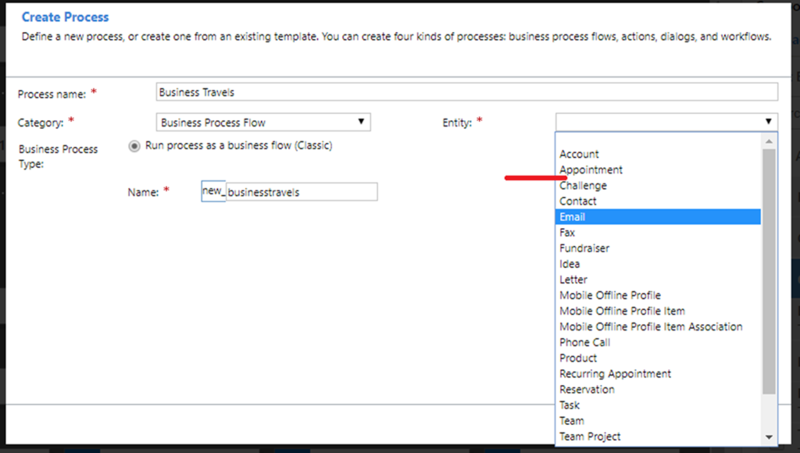 On this new screen there will be a check box called ‘Business process flows (fields will be created)’ select this and then press save at the top of the screen. Note: You cannot undo this action. 6. Finally, publish customisations using the button at the top of the screen. 7. 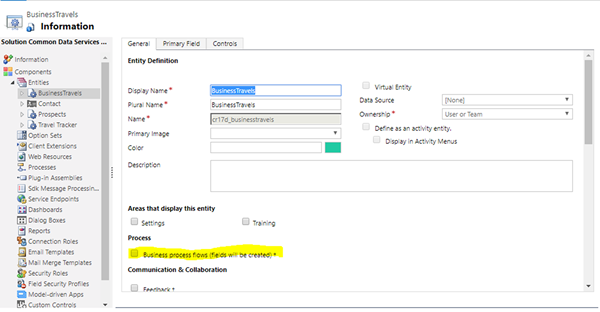 You are done and now able to go back to the App Editor and select your Entity in the BPF wizard and continue creating your BPF. Just repeat these steps for any new Entities that you also wish to make BPF’s with.